Given the above, which site would you expect to rank better for Aaron Wall? Now surely covering the topic of SEO and having 1,000 inbound links per post means some (or perhaps most) of my link popularity pointing at this site is shady (or wonky, as Matt would say), but there should be little to no reason why Aaron Wall.com outranks SEO Book for the phrase "Aaron Wall" unless Google is counting the domain name in that. This site has more and better links, more user data, a more relevant page title, more relevant page copy, and even ranks in the top 10 for "Aaron" and #21 for "Wall". A couple others have confirmed my suspicion that an exact matching domain name can rank a bit better than they otherwise would. Andy Hagans recently posted on the SEO contest, noting 6 of the top 30 results have an exact matching domain name. Google counting exact matching domains a bit more than you would suspect gives them the ability to allow a site to rank for it's official name while still keeping it sandboxed (untrusted, or whatever term you want to call it) for other phrases until Google learns to trust it. I don't think my-spammy-mortage-loans.com gets the same love that a mortgageloans.com (or equivalent) domain name would. And there may be some elements that interface with bid price or perceived market value that help determine how well domain.cc, domain.net, domain.com, etc. should rank for "domain" searches, and how quickly they (and their link popularity and usage data) can be trusted. Anyone done any domain name testing recently? how is it work with subdomains? what would be the ranking of the following urls? I do not think that filename would be as much of a sign of relevancy and quality as would an exact matching URL. 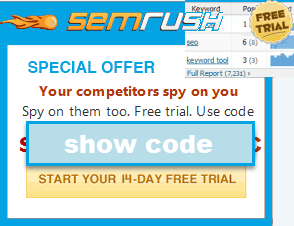 I have recently started to read that linking to over 100 sites will get you penalized. Has anyone noticed a drop in ranking if you have too many links. well its a common thing somehow for domainers to pick the most relevant domain for their company/services. But in the end (aaron is right) it will depend on the quality and the rate that you acquired those links. The problem people have with too many links is that when most people get bulk links they are not natural citations. They are usually junky links. If they trade links with trashy sites and get no legitimate inbound links Google may think their site is trash. If they have no trustworthy inbound links and lots of junky ones they might not rank in Google in the short run...and each additional junky link can end up hurting them more. I had a real piece of junk website ranking #1 on msn (duh), but even yahoo for a fairly competitive phrase. It had an exact match domain name, and drew great traffic even though it (A) had 1 page to the site, and (B) had very few quality incoming links. I really hate when people sign their signatures using fake words. This blog uses nofollow for that very reason, so please stop doing that. I have seen some sites that were flamethrown with links that rank well in Google. Their algorithms are getting pretty complex, and there are many anomalies to any rule of thumb, though the general theory of quality over quantity is best for most sites, at least those ran by owners hoping to rank quickly in Google. Sounds like a great way to drive up G$$G profits and bring domain parked sites featuring adsense ads to the top of the SERPS. Indeed, when I decided to enter the Redscowl Bluesingsky contest as a lark, I noticed immediately that the top 10 entries all had one or both of the keywords in their domain names. I was hoping to break into the top 10 with my humorous "Redscowl Bluesingsky" or "Redscowl-Bluesingsky?" piece (with apologies to Matt Cutts), but at this point I don't think that's possible without the extra boost that a matching domain name would give me. Not for the short duration of the contest... long term, maybe. You seem to be the "google" wizard. Just wondering if you or anyone else has noticed their sites disappearing. I have 15 blogs, innocious subjects, and suddenly this week they all disappeared from google. "Google is counting the domain name"
I think this has been a given for quite some time now, is it really a surprise to anyone? So how come you never bought your own name.com? All of my domain names are bought and hosted on one server. I bought each individual name and host them individually. I use original content, no scrapper programs etc. Even domains that I host on a different server have disappeared. Am very perplexed as to what google is doing and why. Google does seem to be giving more weight to domain names than they used to. They pretty much have to. Whenever they drop the amount of weight given to domain names, then people can't find sites by searching for their official name. It may lead to some spam getting through, but it's better than people not being able to find a site by searching for it's official name. I noticed this two months ago when I launched my wife's olympic blog (see the url linked to by my name). I expected the high ranking to only last a few weeks and then get sandboxed, but the sandbox never kicked in for the site. So it continues to rank high for 2006 Turin olympics. I don't check it's ranking often, I just know that every time I do go search for it, it is still ranked in the top 10 and we continue to get good traffic from Google. Some of that may be due to all the natural links it has receieved as well. Whatever the reason, I am happy with it, since Google is bringing us about 25% of our traffic right now. 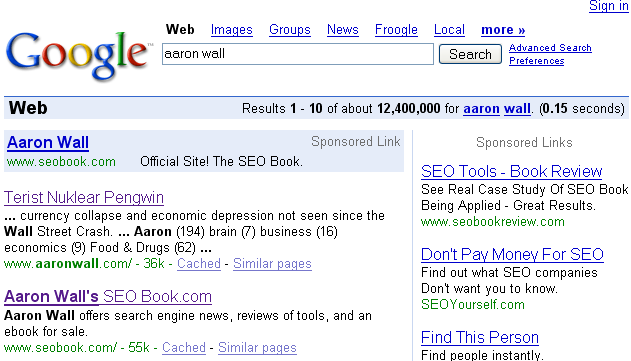 aaronwall.com outranks seobook in the inanchor: test - IMO this is the main reason why, that and the domain name. Maybe Google is afraid of the Terist Nuklear Pengwin. That has got to be it. No, they are not all in favor of seobook, check my post above. aaronwall.com is winning the inanchor search. So what can we take away from this....pretty obvious I think. Yes, I'm going to agree with the guy that said inbound link text is the cause. Due to the nature of reverse indexing, a site has to come up quite highly in the search results without the domain name before it can be filtered for a concatenated string match. Doing it any other way would take up far too much in the way of resources.